There were no grades. 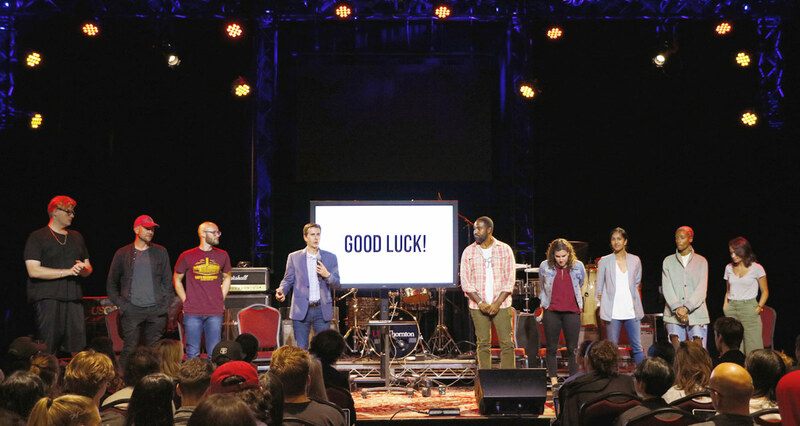 It was a real-world assignment: design a national marketing campaign which aimed to empower underserved musicians and youths in Los Angeles to pursue careers in music. The partners weren’t professors. They were two successful companies and an award-winning artist who visited campus as part of the Pandora Challenge: Music and Social Impact program. Pandora, the largest streaming music provider in the U.S., partnered with nonprofit organization Real Industry to launch Made of Music, the foundation of musician, record producer, and songwriter BloodPop® which seeks to reach young, underserved musicians across Los Angeles. 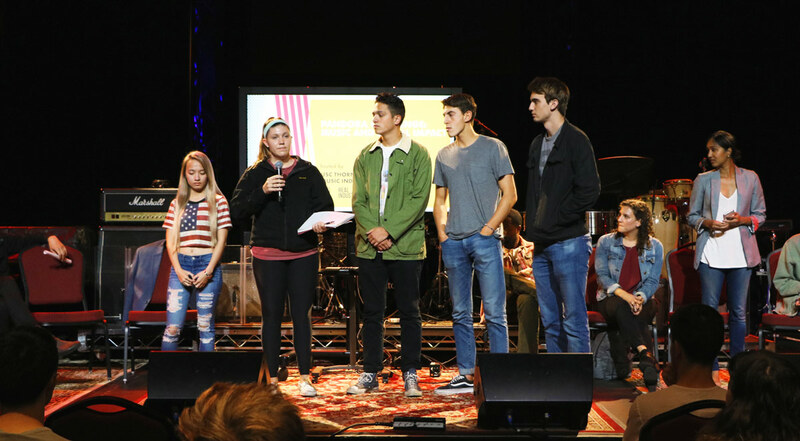 On Wed., Oct. 4, the Pandora Challenge arrived on campus for a kickoff event, and students from Thornton’s Music Industry program were divided into teams ranging from 3-5 members. They had until Oct. 17 to create a campaign that would be judged by a panel of industry experts which included members of BloodPop®’s management team Daouda & Nikki Leonard, Pandora’s artist marketing and industry relations managers Heather Ellis & Vanessa Ide, and Real Industry’s directors Jay LeBoeuf and Priyanka Shekar, and, ultimately, implemented by the foundation. These weren’t pie-in-the-sky proposals. Students were given access to analytics and data from Pandora’s Artist Marketing Platform, Next Big Sound, and 74 million monthly listeners. Granting privileged access to back-end social media and streaming data analytics allowed students to gain first-hand experience, all with resources that are generally available to industry professionals exclusively. “Using these platforms, we were able to identify demographics and geographic populations efficiently,” he said. 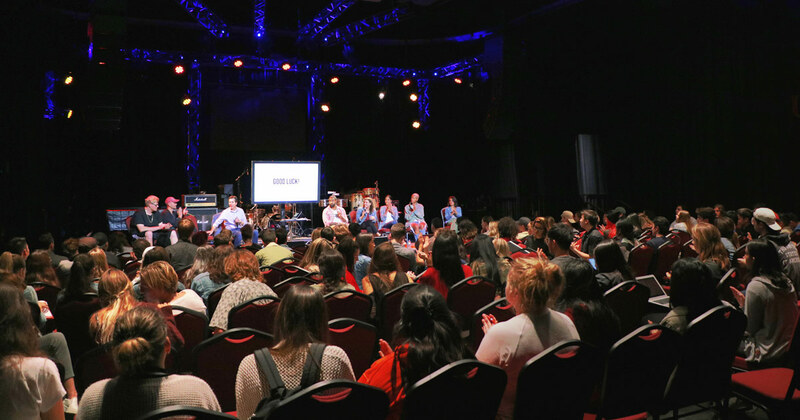 “The opportunity to be back on a college campus, working with students in a group setting to solve important problems in the creative community is unmatched,” said Daouda Leonard, BloodPop®’s manager. Creating a three-phase marketing product which incorporated a music industry quiz and digital hub in combination with regional events such as concerts, workshops and mentorship fairs, a team of seniors that included Solis, Joelle Ferguson, and Benjamin Victor were crowned Pandora Challenge winners. All of the students who participated were incredibly grateful for the experience.